Halloo - Go Mobile with Halloo.mobi! Forwarding number — Update your current find-me, follow-me setting so that you don't miss any important calls. Contacts — Access and search your Halloo contacts database. You won’t have to worry about your contacts list falling into the wrong hands if your phone is lost or stolen. And, managing your contacts on Halloo allows you to store hundreds, even thousands of contacts easily and conveniently. Once you have entered and saved your address, click Send test message. You should receive a SMS alert on your mobile phone if you entered your address correctly. If you do not receive a message after a short time, please check the address and try again, or contact your wireless provider for help. In the body of the test message, there will be a link pointing to the halloo.mobi site. You should be able to follow the link using your phone’s browser to open the halloo.mobi sign-in page. Open this link, and bookmark the address for future use. Similar to your PC’s browser, your mobile browser bookmarks allow you to return to halloo.mobi without having to enter in the full URL. With mobile devices, this is even more important since typing in web addresses is usually very difficult because of the limited keyboard or number pad available on the phone. By including your CompanyID (AccountID) and Username in the URL, you will not have to key those in by hand on your telephone. Once you reach the sign-in page, you will need to enter your My Halloo PIN. As a convenience, you will be able to enter alpha characters in place of numbers for your PIN. For example, if your PIN is “2233”, you will be able to enter “aadd” in the sign-in form. This convenience makes it easier for you to sign-in, since many mobile devices require cumbersome methods to switch from alpha mode to numeric mode. 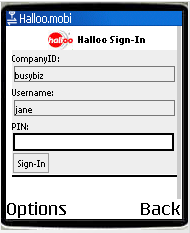 You must enable cookies in your mobile browser in order to use the functions of halloo.mobi. After you sign in, your phone will typically store a cookie to allow you to return without signing in again.